Many things in life are a process. So it is when discerning a vocation to religious life. There are many steps along the way meant to help you go deeper into relationship with God and with the congregation with which you are discerning. This process is not an overnight transformation, but a period of ongoing discernment and formation. "Is this Congregation 'a good fit' for me?" After formal application and acceptance, you participate more fully in community living, prayer and ministry. You remain financially independent during this phase and continue your discernment with the Formation Director. "Is God calling me to a life of poverty, celibacy and obedience?" As a novice you will be given the direction and time necessary to deepen the essentials of religious life and integrate your life of contemplation, mission and ministry and the living of the vows of poverty, chastity and obedience. This time allows you to progress in aligning yourself with the spirit of Holy Cross and develop the elements of religious life as stated in the Copnstitutions of the Sisters of Holy Cross. Normally, this is a two year period. "Am willing and able to make a commitment to Holy Cross?" The profession of Temporary Vows enables you to verify that you can live the apostolic religious life of the Sisters of Holy Cross in accordance with its particular spirit and Constitutions. During this phase, you renew your vows yearly and remain under temporary vows from three to six years. "How can I continue loving and serving God?" This profession of vows for life marks your total commitment to God and full participation in the life of the Congregation. 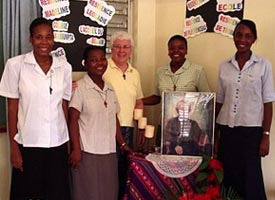 Life as a Sister of Holy Cross is an ongoing process of conversion and integration. Through God's faithful love, you will continue to grow in your commitment.